Look, It's the Worst Bathroom Sign in the World! Bored with typical bathroom trope, one DC coffee shop has decided to skirt tradition and go with a mildly rapey bathroom sign that makes customers stop and say, "Wha?" An eagle-eyed reader sent us this gem, captured at Saxby's Coffee at K Street and Vermont Ave. It appears that the water closet at the establishment is demarcated with a sign that indicates that men just can't get enough of watching ladies erotically use the toilet. What is this, Japan? Anyway, if you ever find yourself in the District, make your way to Saxby's. 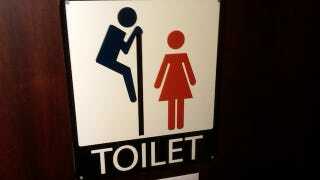 Where the coffee is hot, the people are cool, and the stick figures are bathroom peeping toms.